Dernièrement, j'ai fait la découverte d'une belle compagnie californienne : Aenon's. Évidemment, les produits sont fabriqués avec des ingrédients naturels et ne contiennent pas de produits chimiques. Ils sont fabriqués en petite quantité avec des ingrédients de qualités issues de l'agriculture durable (petites fermes). Si vous voulez en savoir plus -- ici ou ici. Lately, I have discovered a nice company from California : Aenon's. Obviously, the products are made with natural ingredients and do not contain any chemicals. They are produced in small quantities with high-ingredients coming from sustainable farming (small farms). If you want to know more -- ici ou ici. J'ai un gros coup de coeur pour le nettoyant pour le visage Aloe + Calendula Face Cleanser* qui ne contient pas de savon. Ses promesses : Un nettoyant sans savon qui enlève doucement les impuretés sans "décapé" la peau de ses huiles naturelles" C'est exactement ça. Il laisse un film protecteur sur la peau qui pourrait peut-être déranger certaines personnes (moi au début), mais je l'ai grandement apprécier par la suite et il ne m'a causé aucun bouton. Après avoir laver ma peau, j'éprouvait une sensation de confort grâce à ce nettoyant. Ce nettoyant est à base d'aloes et de Calendula infusé dans une huile de tournesol. La liste d'ingrédients complète n'est pas disponible sur le site, ce que je trouve embêtant, mais elle l'est sur la bouteille. Par contre, je trouve pratique de la trouver sur le site, car on peut vérifier avant de faire son choix si on achète ou pas. Je ne vais pas la recopier à la main (normalement je copie-colle du site), mais si vous êtes intéressés, je vous conseille d'écrire à Queenie, la fondatrice. "A soap-free cleanser that gently removes impurities without stripping away your skin's natural moisture." J'aime utiliser des toniques avec de l'eau d'hamamélis, car c'est un ingrédients simple, mais efficace pour calmer les peaux stressées, irritées ou enflammées. Par contre, celui ci contient de l'huile de lime et je ne saisi pas bien les bénéfices de l'huile essentielle de lime sur la peau. I have a huge coup de coeur for the Aloe + Calendula Face Cleanser* that does not contain any soap. Its promises: A soap-free cleanser that gently removes the impurities without taking away the natural oils from the skin. That's exactly it. It leaves a protective film on the skin that could maybe disturb certain people (me included at the beginning), but I really appreciated it after and it didn't cause me any breakout. After washing my face, I experienced a a feeling of comfort thanks to this cleanser. This aloe and calendula-based cleanser is infused in sunflower oil. The complete list of ingredients is not available on the website, which I find a bit sad, but it appears on the bottle. In fact, I find it very practical to find it online, because we can check before deciding if to buy or not. I won't re copy it by hand (normally I copy and paste from the website), but if you're interested, I recommend that you write directly to Queenie, the founder. I love to use toners with witch hazel water because it is a simple ingredient, but very efficient to relax stressed, irritated or inflamed skin. However, this one contains lime oil and I do not fully understand the benefits of lime essential oil on the skin. I can't stand the smell during the application, this toner makes cough every time, so I use it for my clay masks. J'ai utilisé l'huile seulement quelques fois, je vous en reparlerai lorsque je l'aurai utilisé sur le long terme.. La composition est différente de ce j'ai l'habitude d'utiliser, ce qui me rend curieuse (huile de chanvre, extrait de fruit elderberry et huile de lime). I have used the oil only a few times, so I will talk about it again after a longer use..the composition is different from what I normally use, which makes me curious (hemp oil, elderberry fruit extract and lime oil). 2. What is the main reason for you to start your own company? 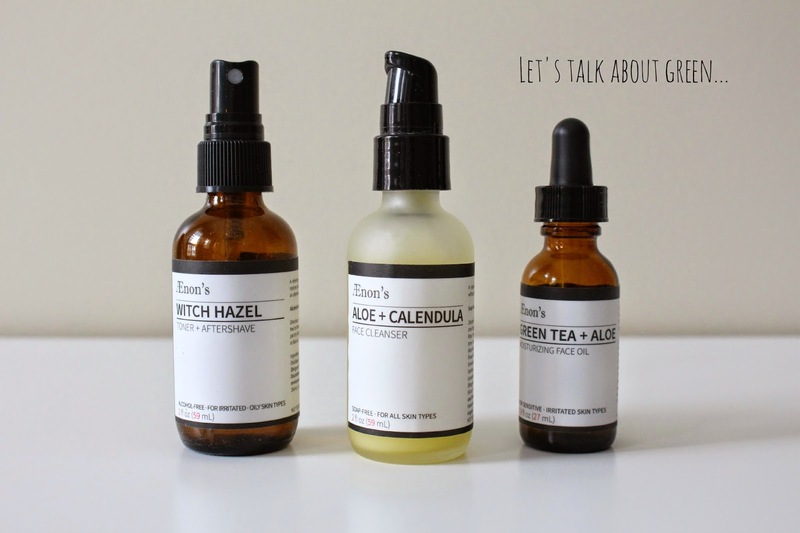 I have sensitive skin, so finding the right beauty products has always been a challenge. Making matters worse, a recent move from New York City to Los Angeles left my skin extremely dry and easily irritated. I tried many different brands at a variety of price points but nothing seemed to work and some even made me break out! As I was cleaning through my bathroom drawers I was surprised by how many products I had accumulated over the years. And even more shocking? The lengthy list of ingredients they all seemed to contain. All of the money I had been spending on what I thought were healthy, natural beauty products had actually been going to cheap fillers and chemical substitutes. In fact, the more I learned about the ingredients used in most beauty products, the less I wanted to use them. 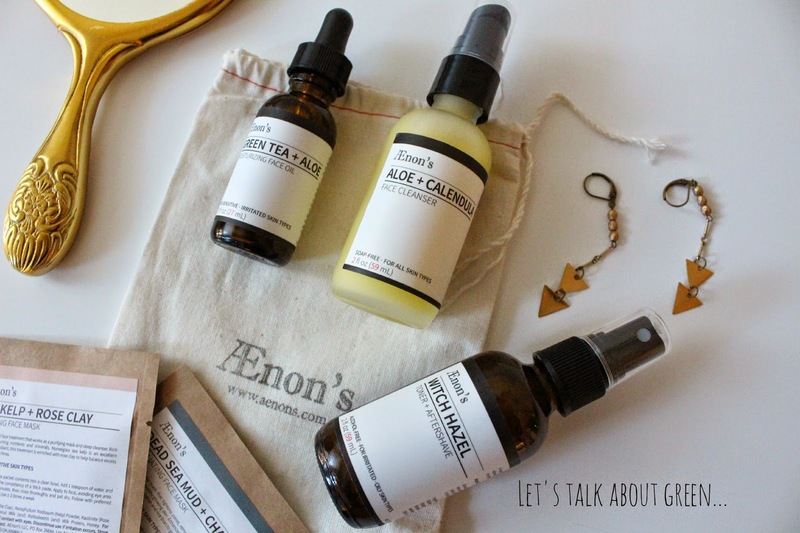 My search for natural alternatives led me to the study of folk medicine and herbalism, approaches that I use today in the construction of Aenon's line of minimal, versatile and honest beauty products. 3. What is the ingredient that you enjoy the most to work with? It’s hard to pick just one! My favorite herbs are probably Aloe Vera and Lavender - they’re both so versatile and soothing. But really, I love every ingredient in my formulations, as I select each of them for their unique properties. At the moment I’d have to go with the Aloe+Calendula Face Cleanser. It’s non-foaming, soap-free but can still remove makeup and dirt, all without stripping your skin of its natural oils. A lot of people use cleansers that are far too harsh, reasoning that if it’s not foaming and bubbly, then they’re not properly “cleansing” their skin. That couldn’t be further from the truth though, and I’ve heard from many customers, who - after using my Aloe+Calendula Face Cleanser - have sworn off traditional, soap-based and foaming products. I spent a lot of time in the studio developing my Aloe+Calendula Face Cleanser (just ask my husband!). I wanted to create something that used the oil cleansing method, but in a gel-like format that can be used on wet or dry skin. After washing off the product, your skin may feel a little “oily” but that’s because the product is completely soap-free, which means there are no harsh drying effects. Once you pat your skin dry, the “oiliness” goes away and you’re left with soft, fresh skin. While I haven’t been able to travel as much as I would like (starting your own business takes a lot of time, after all), I’ve been fortunate enough that the places I have visited have all left deep, lasting impressions on me. For example, I once spent time on Hvar, a Croatian island renowned for its lavender. Everywhere I went, that heavenly scent permeated the air, and those fond memories come flooding back to me whenever I use lavender in my formulations. Similarly, a trip to Iceland left me floored by the country’s landscape and unpolluted air. 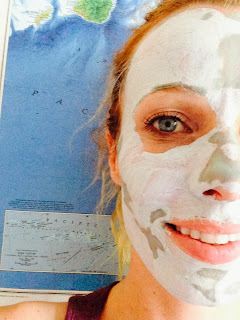 When developing my face masks, I chose to use ingredients like Sea Kelp harvested from the cold, clean waters of Iceland and dried at low temperatures to keep the nutrients intact. My newest product takes inspiration from Hawaii, where my husband and I went on our honeymoon. Good things take time, so I’m not ready to reveal exactly what it is, but I can tell you that it will use ingredients grown and harvested on the islands. I hope that we’ll be able to go back some day, but even if not, my work with Aenon’s can provide a link to the time we spent there. Voilà une autre compagnie intéressante.. Avez-vous déjà essayer cette marque ? Si oui, qu'en pensez-vous ? Connaissez-vous les bénéfices de l'huile de lime sur la peau ? Here is another interesting company.. Have you ever tried this brand ? If yes, what do you think about it ? Do you know the benefits of lime oil on the skin ? Interesting, thanks for the brand introduction. I'm definitely getting an apothecary vibe from them. I loved the interview and I'm planning on looking into this brand further. Lovely review! Hey Nikky, here's the answer of Queenie on instagram about lime oil "Lime oil is great for oily / acne prone skin types as it assists in drying excess oil and re balances the skin. There are 2 types of lime oil - cold pressed and stream distilled. Steam distilled (which is what i use in my formulations) do not have the photo sensitizing compounds that cold pressed lime oil can cause. However, i highly recommend everyone wears sunscreen during the day no matter what oil/lotion/moisturizer they're using!" OOO really! Same things happens to me a couple weeks ago with a brand near me! These 2 women -Nic from orgaNic obsession (sweden) and tamara from rainbow feet blog (UK) learn me i have a beautiful soap shop in Québec, Canada.. haha!